Rose Hunter Gingham Bags 25 Pk 5-1/2x3-1/4x8-3/8"
Rose size Hunter Gingham Paper Shopping Bags by the 25-Pack. Green Way ® Eco-Friendly Packaging. Made in the USA. Gingham Kraft Paper Shopping Bags are perfect for a "country" look. Bags have serrated edge tops & sturdy paper twisted handles. Choose from either Burgundy or Hunter on Natural Kraft or Apple Green on White Kraft. 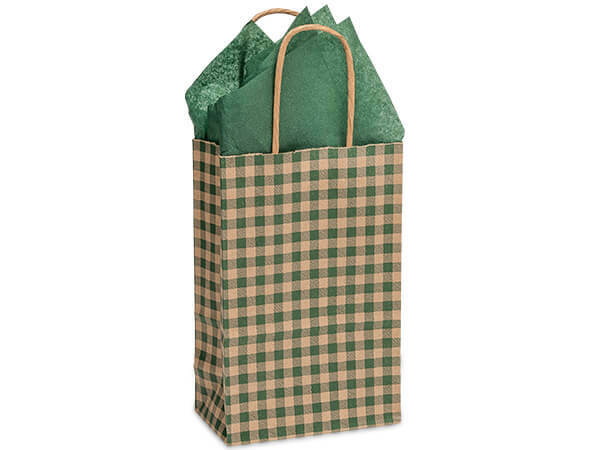 Gingham bags are great for Christmas and year-round packaging. Bags are 100% recyclable and contain minimum 40% PCW content. Green Way® Eco-Friendly Packaging.